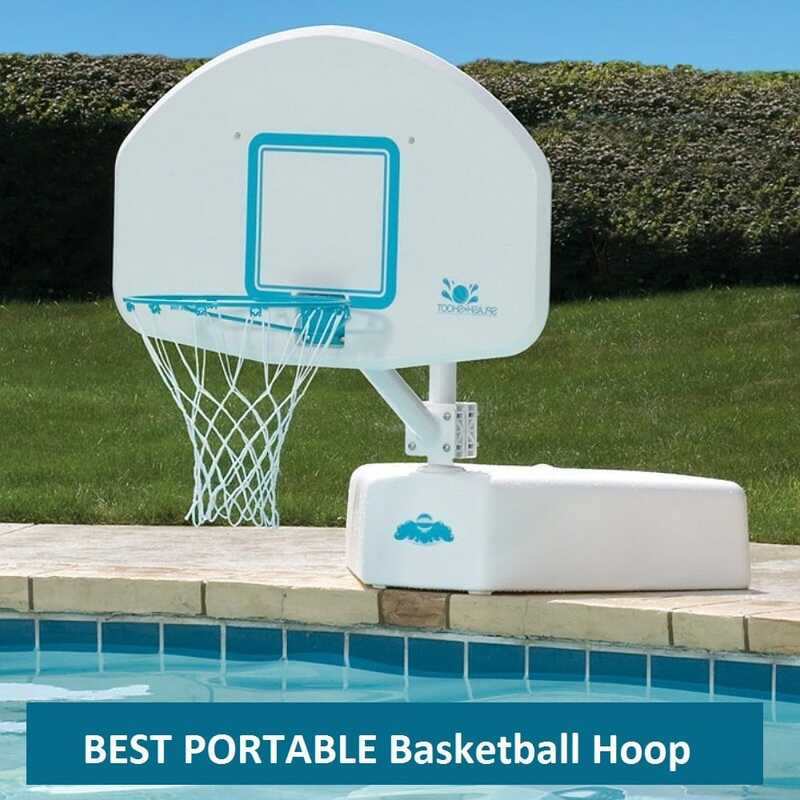 Feel free to browse and read our in-depth reviews further down as well as perhaps consider buying a separate basketball hoop and volleyball net which can then stay there all the time saving you having to swap over. More info towards the end of this article. The Pool Sport 2 in 1 is a popular choice for many people thanks to its pleasing design, durability and robustness. And all of that for a reasonable price. Transition from one game set up to the other is an easy affair and you don’t need any tools. Set includes both a basketball, a pink volly ball. and a ball pump. You can’t expect stainless steel at this price and there is a tendency for the rim to rust unless you grab a can of rustoleum at the beginning of each season and give the rim a nice clear coat. 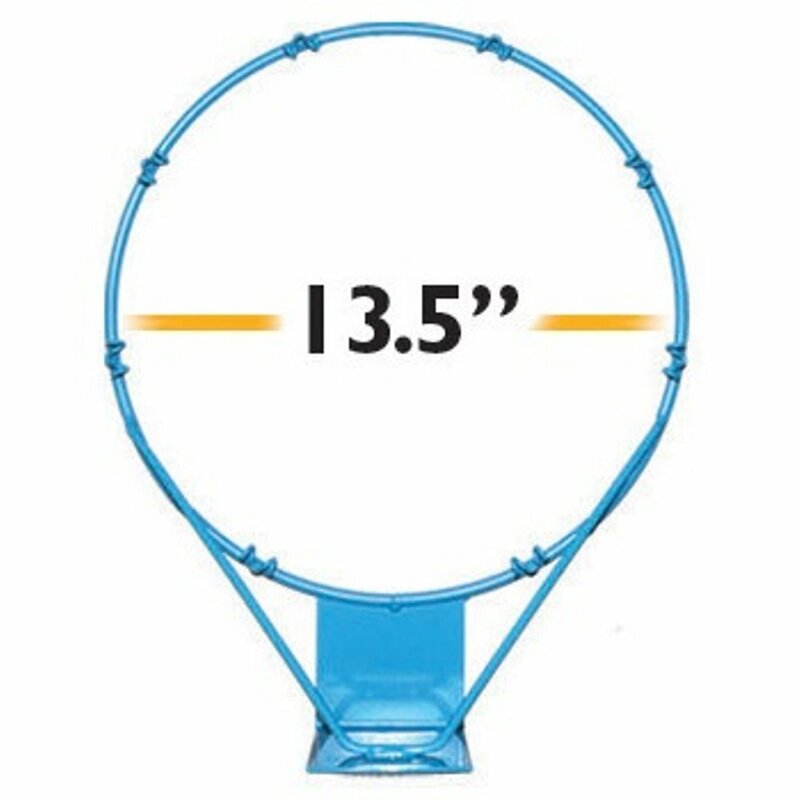 Alternatively, there is a replacement stainless steel hoop available. Let’s start with the good: It’s all plastic which means there are no parts that can rust. 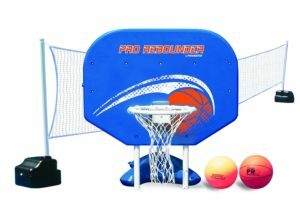 Just like with other combo sets the parts only allow to set up for either basketball or volleyball. Seems obvious but some people are not aware that the posts can either be used for volleyball or basketball, not both at the same time. Changing over doesn’t require any tools. It’s easy to set up right out of the box, just slot in the pieces and fill the base with water using a garden hose pipe. It’s an all plastic toy set which means there are no parts that can rust. The basketball is quite light and might not last very long. The net is a bit flimsy and difficult to set it up so it doesn’t sag. Changing over doesn’t require any tools. 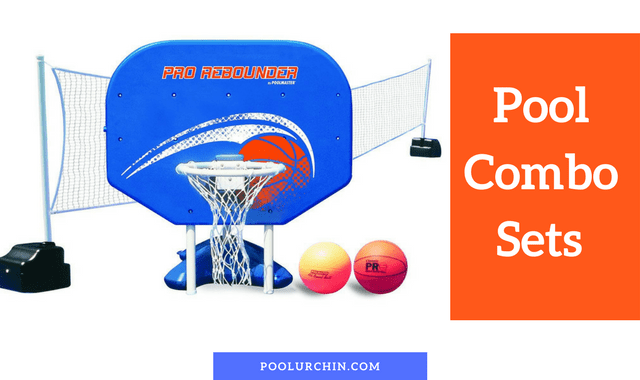 The Pro Rebounder Combo set is the only one that allows you to have pool ready for volleyball and basketball at the same time. 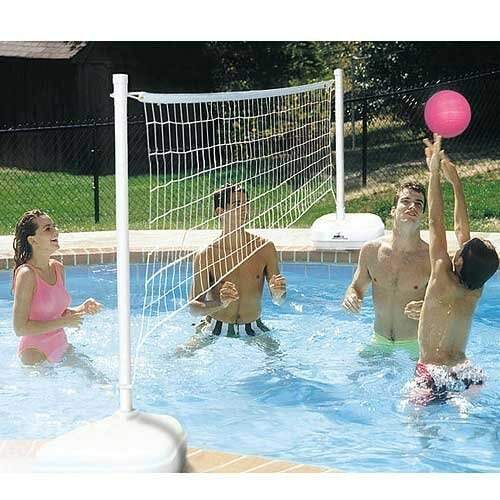 The volleyball net can be used for pools up to 38′ in width. The set is well made for the money. The only real weak points are the poles which may break or split sooner than you would like. 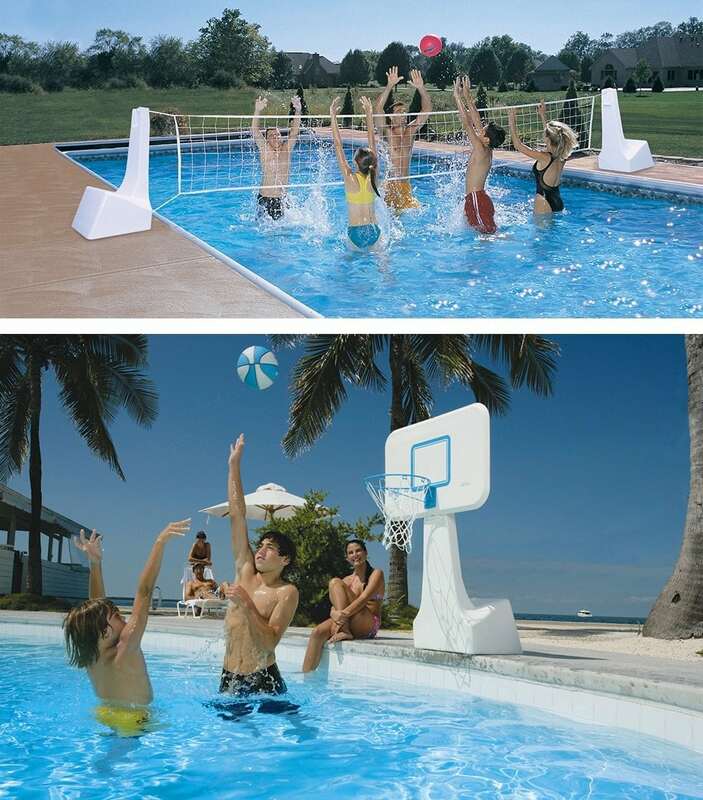 The volleyball has a nice feel, weight and size for family fun games. 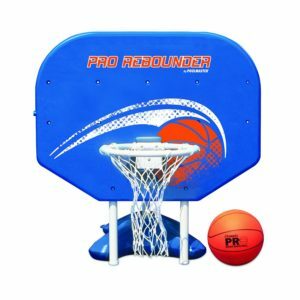 See our review of the Pro Rebounder Pool Basketball Hoop here. Most 2 in 1 sets have one big disadvantage: You can only play either one or the other, either basketball or volleyball and it always requires some reassembly. If you like to have both available all the time have a look at these 2 great combinations of game sets that are similar in style. AquaVolly includes 2 white heavy duty plastic bases with sturdy no rust aluminium posts. The net spans pools up to 24 foot wide but you can shorten it if needed. 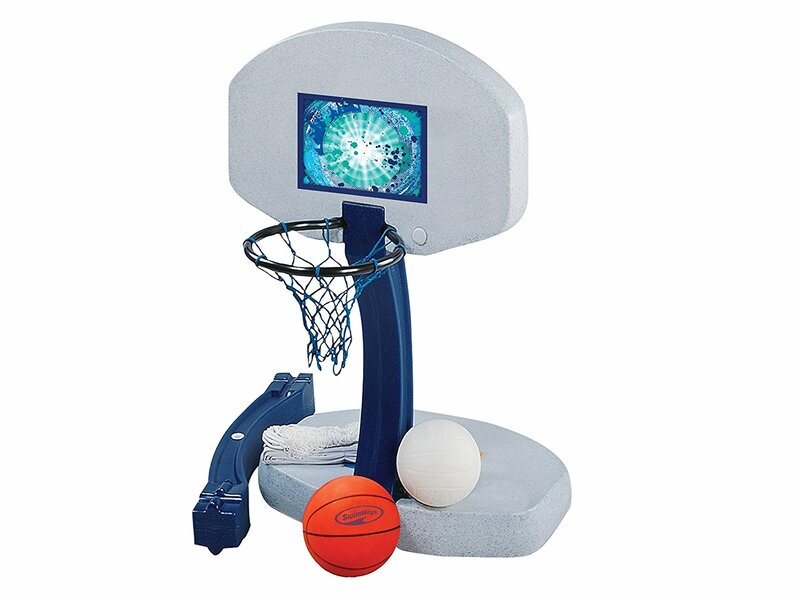 The Splash and Shoot basketball hoop made by Dunnrite is a great game all on its own. 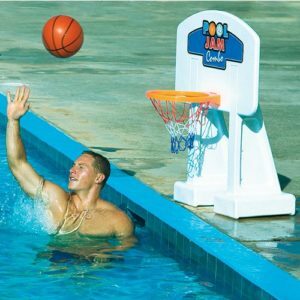 It looks good at the poolside, doesn’t budge and the hoop height can be adjusted. A big plus is the no rust hardware: stainless steel rim and bolts ensure a long life. Ready to go for a stylish looking addition to your pool? If you like to keep your pool environment tidy this should be the best combination. 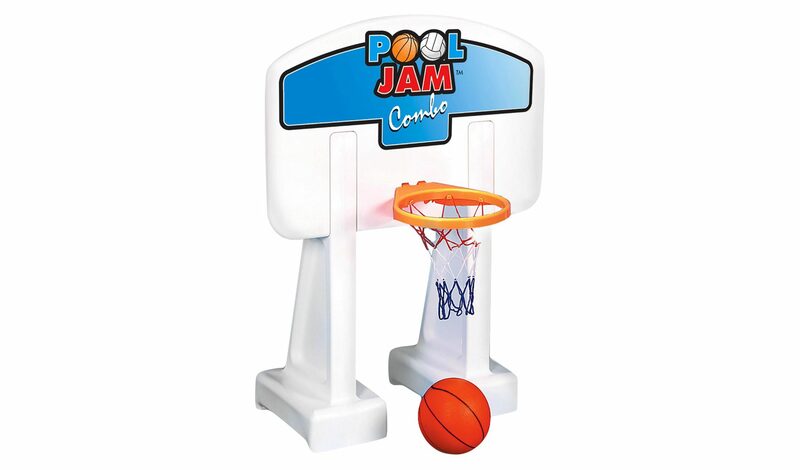 The Clear Basketball Hoop is sturdy and, at the same time adds a touch of style and design. Stainless steel and brass hardware throughout ensures good looking longevity. 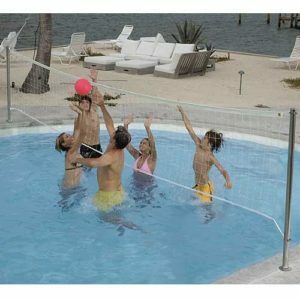 The volleyball posts are also made of stainless steel and include escutcheon rings to cover up rails prior to installation to cover the anchor socket or grout prior to installation. 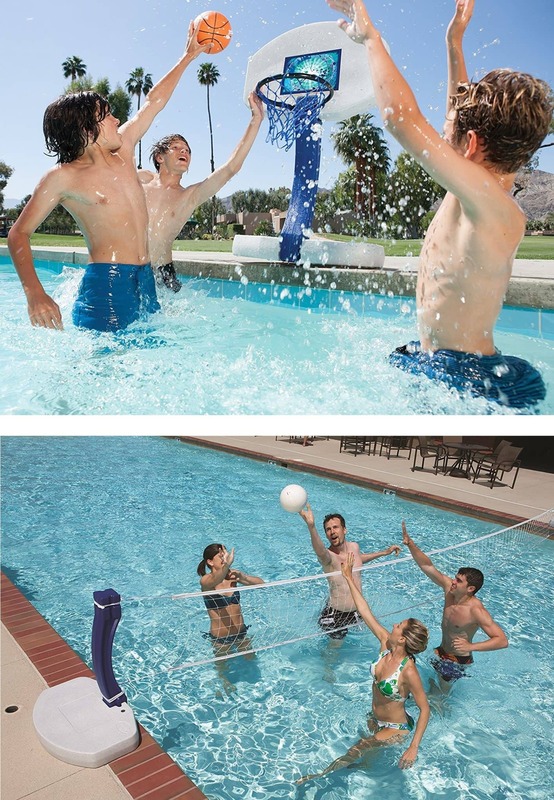 The 24 foot net is long enough for most residential pools and can be adjusted for a custom fit.